When I walk into a ceremony being held at a grand chapel, the first thing I notice is the architecture and the detail of the sanctuary. From the high ceilings to the magnificent archways and pillars, there is something about a classic church wedding that is both intimate and elegant. Seeing a bride and groom recite their vows at the front of the church, watched by their loving friends and family, is a very moving and emotional scene. David and Ambar’s wedding was nothing short of emotional. 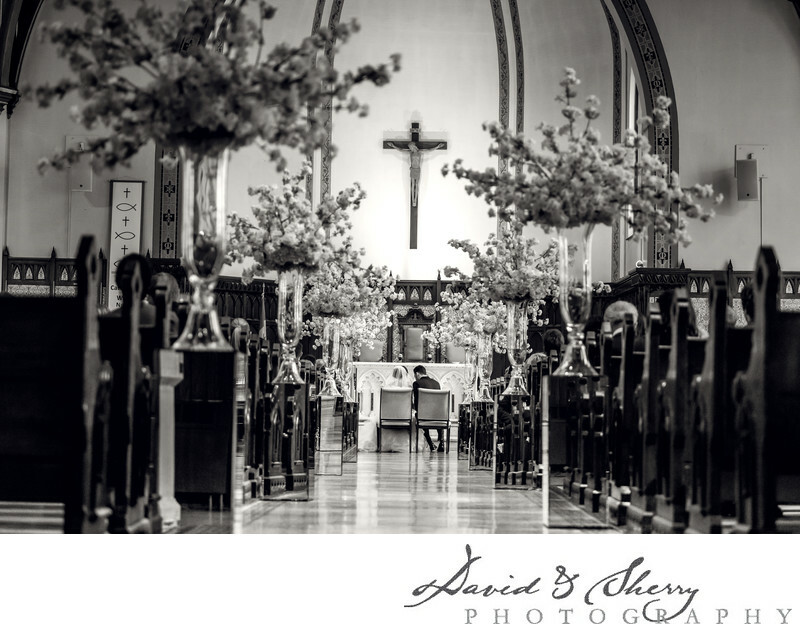 The beautiful ceremony was held at Our Lady of Mercy Church in Sarnia, Ontario. The floral décor made the venue unique and stunning, which large, glasses vases of tall bouquets lining the aisle. I will never forget the look on the groom’s face as he saw his bride for the first time. The emotion of this ceremony was truly moving, and the location complimented this perfectly. I took this shot of the happy couple from the back of the room, with the purpose of isolating the moment that they were having together. The floral décor in the foreground, as well as the cross and archways overhead, make the shot interesting, yet the eye still focuses on the intimacy between the newlyweds. Location: 390 Christina St N, Sarnia, ON N7T 4V5.